The original group consisted of Alvin Pleasant Delaney Carter (A.P. 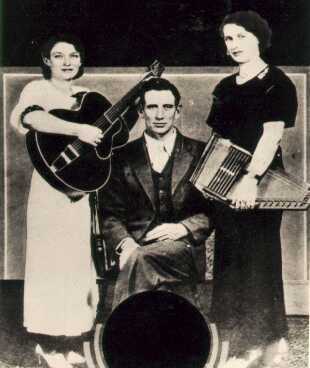 ; 1891-1960), his wife, Sara Dougherty Carter (autoharp and guitar; 1898-1979), and Maybelle Addington Carter (guitar; 1909-1978). Maybelle was married to A.P. 's brother Ezra (Eck) Carter. All three were born and raised in southwestern Virginia where they were immersed in the tight harmonies of mountain gospel music and shape note singing. Maybelle's distinctive and innovative guitar playing style quickly became a hallmark of the group. They were elected to the Country Music Hall of Fame in 1970 and they were given the nickname "The First Family of Country Music." In 1988, the Carter Family was inducted into the Grammy Hall of Fame and received its Award for the song "Can the Circle Be Unbroken". It's unlikely that bluegrass music would have existed without the Carter Family. Although the original Carter Family disbanded in 1943, enough of their recordings remained in the vaults to keep the group current through the '40s. Furthermore, their influence was evident through further generations of musicians, in all forms of popular music. Big Dogs That Talk Please honor us with a consideration. All the best to you. * Your song 'Bury Me Under the Weeping Willow' has just been added to AOR Overflow station! * Your song 'Bury Me Under the Weeping Willow' has just been added to Goin Out West With The Sumner Brothers station! * Your song 'Bury Me Under the Weeping Willow' has just been added to FAME & GLORY station! * Your song 'Bury Me Under the Weeping Willow' has just been added to WCRV RADIO station! * Your song 'Bury Me Under the Weeping Willow' has just been added to A COUNTRY AFFAIR station! * Your song 'Bury Me Under the Weeping Willow' has just been added to Music for the Ears station! * Your song 'Wildwood Flower' has just been added to Music for the Ears station! * Your song 'Wildwood Flower' has just been added to Nashville Indie Stars station! * Your song 'Wildwood Flower' has just been added to Gyroscope station! * Your song 'Wildwood Flower' has just been added to Green River Radio station! * Your song 'Wildwood Flower' has just been added to Drunk Appalachian Rapture station! * Your song 'Bury Me Under the Weeping Willow' has just been added to Drunk Appalachian Rapture station! * Your song 'Wildwood Flower' has just been added to Shake Rag Music Radio station! * Your song 'Bury Me Under the Weeping Willow' has just been added to Tax & Regulate Cannabis 2010 station! * Your song 'Wildwood Flower' has just been added to Tax & Regulate Cannabis 2010 station! * Your song 'Wildwood Flower' has just been added to GRAND OLE OPRY station! * Your song 'Wildwood Flower' has just been added to highway 66 WITH PIP & merry station! * Your song 'Wildwood Flower' has just been added to COUNTRY AFFAIR with pip & merry station! * Your song 'Wildwood Flower' has just been added to FOUR;S COMPANY with pip & merry station! * Your song 'Wildwood Flower' has just been added to CHIMES OF FREEDOM RADIO FM station! * Your song 'Wildwood Flower' has just been added to MOUTAIN RADIO FM station! * Your song 'Bury Me Under the Weeping Willow' has just been added to Copesetic station! * Your song 'Bury Me Under the Weeping Willow' has just been added to Get Down Music Nashville station! IMP Your song 'Bury Me Under the Weeping Willow' has just been added to some names you probably heard of station!